I’ve done a audiobooks post before but now that school is back in session I felt the need to do another one! Mainly because this year I am now driving myself to campus which is an hour away! Gives me plenty of time to listen to books! I recently got back into audiobooks after months of not listening to them. 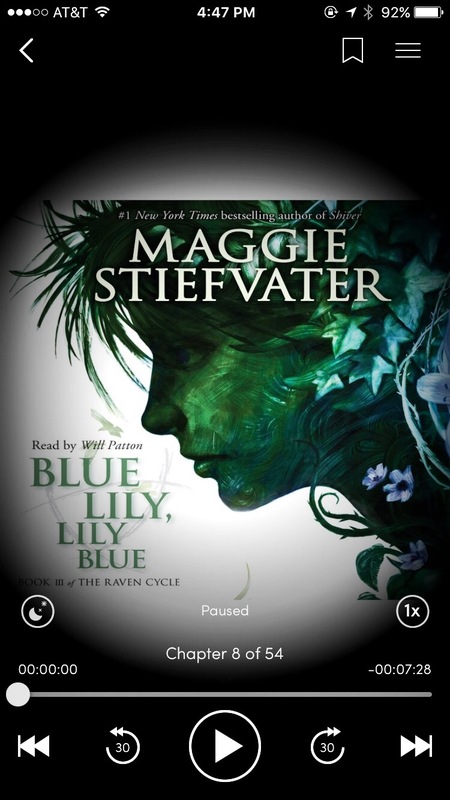 I’ve so far plowed through The Dream Theives and I’m listening to Blue Lily, Lily Blue both by Maggie Stiefvater! The book being narrated by Will Patton! He is so good! Each character is done so well and I love listening to him! Since school is an hour away from me I end up listening to an hour going up and an hour going down! So I get a lot done during that time! Then when I get to school I read another book in physical form this time. Currently it is Queen of Shadows by Sarah J Maas! I’ll be linking sites on here for audiobook sites you can check out. My favorite is Scribd. I get one audiobook credit and three ebook credits each month. I think the price is 8.99$ a month so not too bad to me honestly. Since I wasn’t using it for a while I have a lot of credits saved up so I can’t wait to see what I’ll use them on! Hit me up with audiobook suggestions! I have the Raven King by Maggie Stiefvater on audio, same with Illuminae by Amie Kaufman and Jay Kristoff. What else should I listen to? Let me know in the comments! Let me know as well if you use Scribd! Or Audible! Do you enjoy listening to audiobooks? Or is physical the only way for you? Comment below about it!